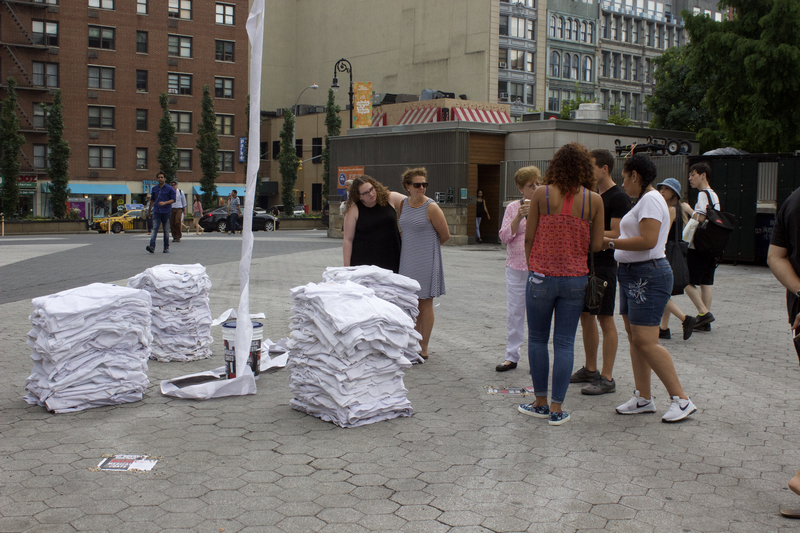 New York, NY – A public art installation project titled, “800 Medical Coats,” was presented in Union Square Park (North Plaza, near E 17 St.), for one day on Sunday, July 23, 2017, from 8:00am to 8:00pm. 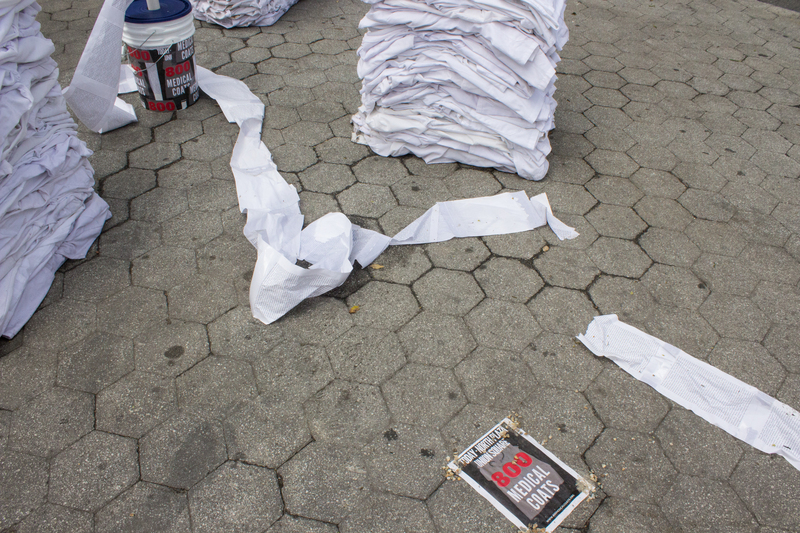 A collective art project between national medical student-run human rights team and NYC-based artist Rosary Solimanto. 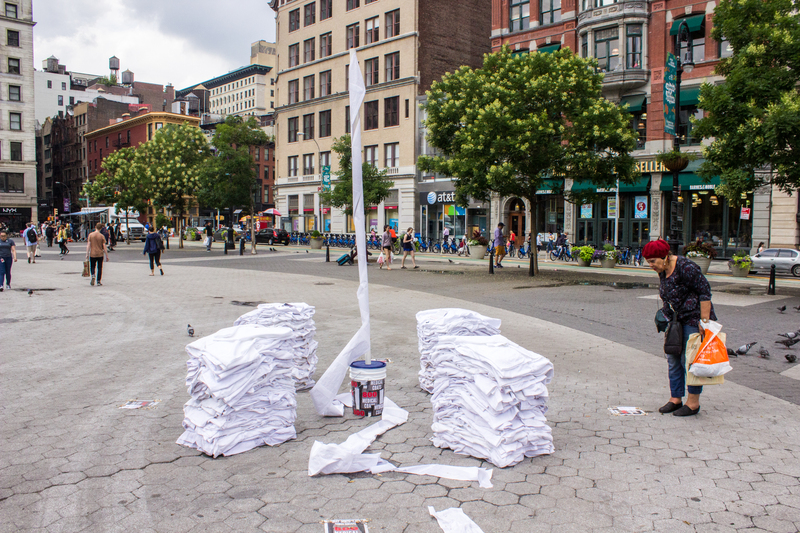 The public art installation will be constructed of 800 white medical coats, honoring the 800+ fallen medical providers from the Syrian conflict. The Syrian conflict is not on this continent, and so most people forget the hundreds of heroes who have lost their lives providing health care in some of the most dangerous conditions imaginable. In Syria, health care providers are killed, incarcerated and tortured, and health care facilities and ambulances are systematically attacked. One of the weapons of war is depriving Syrians of health care which is a serious war crime that violates the principle of ‘medical neutrality’ as established by the Geneva convention. Syria has become one of the most dangerous places in the world for health care providers, leaving health workers in a dangerous crisis, and Syrians without health care, one of the many reasons they are forced to leave. Although there have been denunciations, action has not been taken to bring the perpetrators to justice and stop these violent human rights violations. This project creates an awareness surrounding war crimes and violation of ‘medical neutrality’. We have a responsibility to help ensure the safe delivery of health care in all corners of the world, and this project will help our communities become more aware of and engaged in this issue. Each medical white coat will represents a life killed in the attacks on Health Care in Syria and will hopefully move the viewer to realize the dire situation in Syria. It is a collaboration between Physicians for Human Rights Student Advisory Board, Syrian-American Medical Society (SAMS) Foundation, and NYC-based artist Rosary Solimanto.